Part of my night time routine right before I go to bed is to luxuriously massage my face with AVEENO POSITIVELY RADIANT Intensive Night Cream! Ever since Influenster gave me the chance to test it out, I have been in heaven! They even included an adorable eye mask for sleeping with. 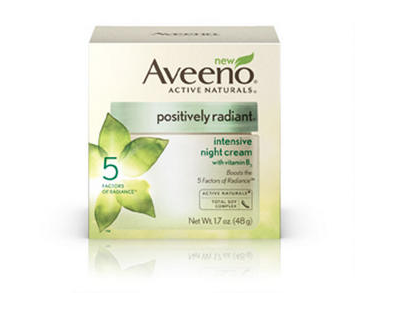 AVEENO POSITIVELY RADIANT is formulated with ACTIVE NATURALS Total Soy Complex and Vitamin B3 which leaves your skin nourished and smooth. It's great when you need a more even skin tone and texture and when you want a healthy glow! The secret is the soy complex. Chinese medicine has used soy for thousands of years to reduce blotch and discoloration so when AVEENO scientists decided to use this, it has proven to make a great product with long-term skin benefits. It went on so smooth and wasn't oily or greasy. It absorbed quickly so I didn't have to worry about laying my head on the pillow and getting lotion on it. After just 4 days of use my skin is so much brighter and softer and I don't look like my skin has been damaged over the past 26 years of my life. This stuff is amazing and it's so fun to massage it on my skin right before bed to help relax me! "I received these products complimentary from Influenster for testing purposes.